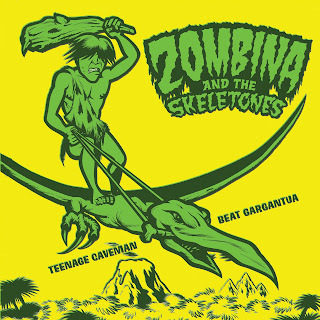 The Jurassic monster that is our new single, the creationist anthem, "Teenage Caveman Beat Gargantua" is available to buy right now over at the shop page. It's on LIMITED EDITION GREEN VINYL! It's got the conceptastically space-age "Futurelife" on the other side! It's got Darren Merinuk artwork. It's a rock monolith for the ages!!! You can also download it as an MP3 from iTunes, Amazon and most good MP3 vendors!